Have you got your long sleeves on and maybe a pair of work gloves? 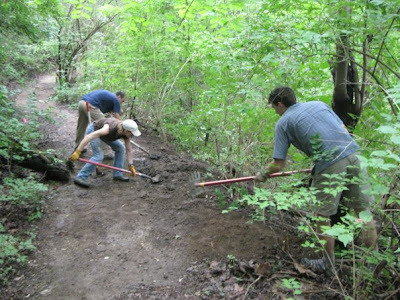 Today we're getting some of the heavier work done on our spiritual trails as we continue a little spring maintenance. How are we doing this heavy labor? We're just asking ourselves some soul-searching questions, digging for the truth of the matter in God's Word (actually I'm doing the digging for you unless you want to do some more), replacing any stumbling blocks on our paths with stepping stones of truth, and continuing on down the trail. Have at it! Is there anything impeding my progress? Something that has fallen across my path while I wasn't paying attention? Something from the enemy? Something, perhaps, that isn't "evil," but just isn't best for me? Anything that is keeping me from moving forward and is causing me to stand still? Fear, doubt, laziness, unbelief, distractions, sin? Does evil lurk in the shadows on my path? Have I let temptation come too close? Have I disregarded all the signs that danger is ahead if I continue on the path I'm on? Have I joined ranks with those who live ungodly and unruly lives and are they rubbing off on me instead of me boosting them? Don't walk on a dangerous path, dear friend. Let Jesus take an honest look at the path you're on and identify any hidden dangers. And then grant Him permission to get rid of them. No cherished sins, no bad habits, no "innocent" vices, no dangerous liaisons. Don't let anything that can potentially trip you up stay on your trail. Bless you for hanging in there with me!